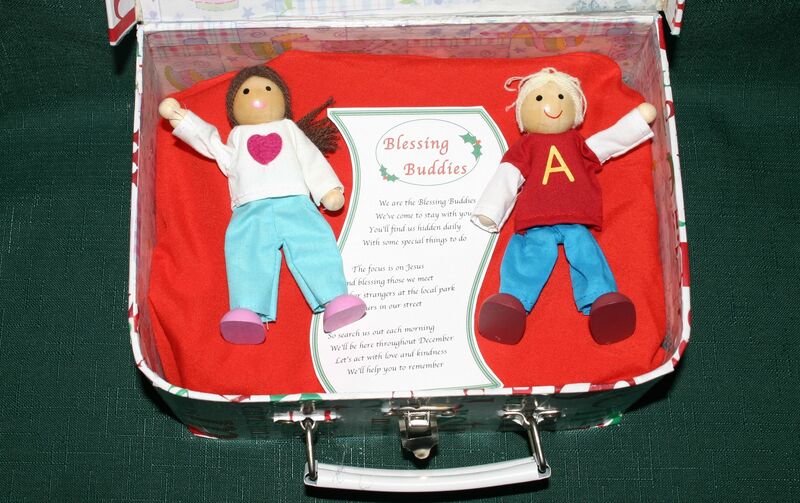 The Blessing Buddies are the latest addition to our Christmas traditions and have come about in order to help us focus on blessing others throughout the Christmas season. We make an effort to ensure that we have a Christ-centred Christmas, designing our activities around the celebration of the birth of Jesus and continuing with some much-loved family traditions. After seeing the Elf on the Shelf, Kindness Kids, Light ’em up, R.A.C.K. (Random Acts of Christmas Kindness) and other ideas that are around, I combined several elements and came up with our Blessing Buddies. The children will love the surprise of having something to search for each day, the fun of finding them in a new pose, a daily act of kindness directed towards others to complete (big or small), a character quality to focus on and bible verse to start our day. 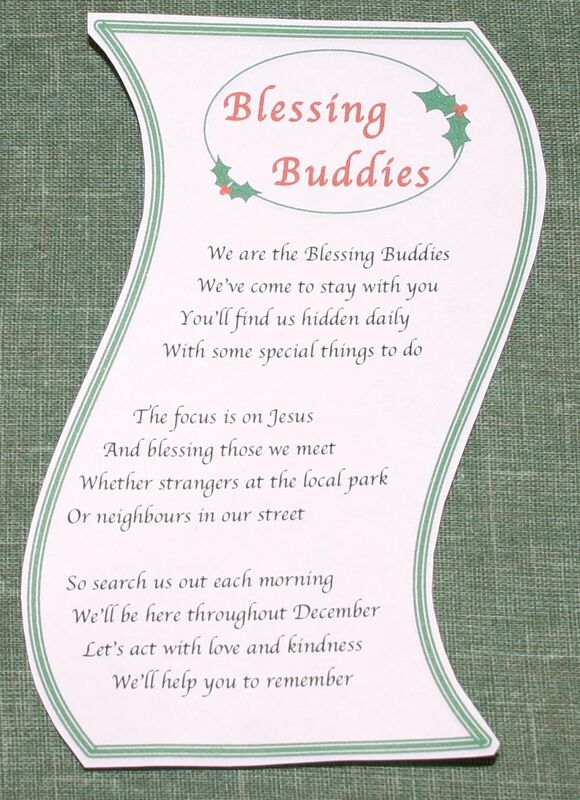 The Blessing Buddies will be making their appearance on the first of December. A boy and girl bendable wooden doll will “arrive” in a package in our mailbox. A poem of explanation will be included to introduce the concept. The dolls are part of a wooden doll house family from Kmart. They came with a Mum, Dad and baby for $15. The suitcase came off someone’s verge during the local verge collection! 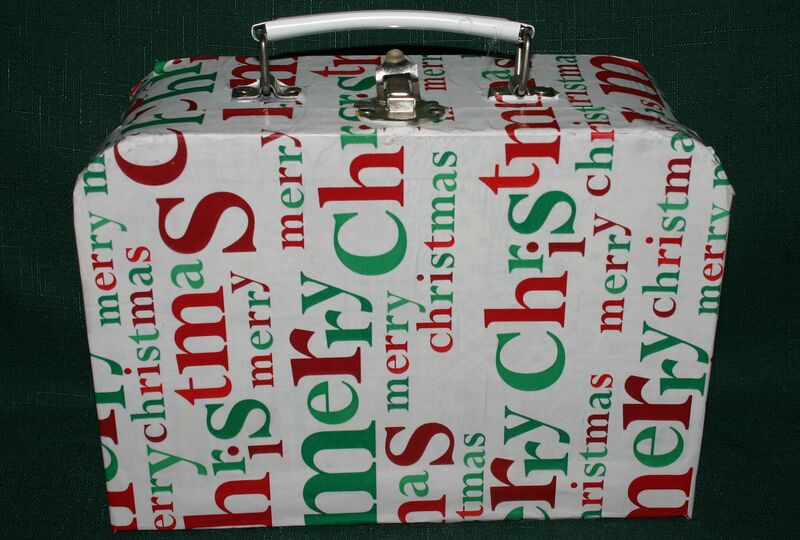 I just fixed it and covered it with Christmas paper. Sorry, don’t know where to find those in a shop; maybe somewhere like the craft section in Spotlight or Bunnings where you buy the blank cardboard/MDF wood boxes and shapes for craft projects? Each morning the children will find the Blessing Buddies hidden around the house in a different pose that links to the act of kindness we will be carrying out that day. They will also have a note with the day’s character trait including bible verse and discussion questions and a bag containing all the materials necessary to complete the act of kindness. The Blessing Buddies should be a lot of fun as we seek to be aware of those around us by meeting their needs, helping them to know that God loves them or simply just bringing some joy into their day. I have created a master list of ideas for blessing others with some suggestions of ways to pose the Blessing Buddies. Get permission to access the Pastor’s office at church and plaster it with notes of appreciation and individually wrapped chocolates or lollies. This would also work in Dad’s work office, a teacher’s office or anything similar. Pose the Blessing Buddies with notes of appreciation (something kind the kids did the day before), sitting in a box or basket of individually wrapped chocolates, sealed in an envelope with writing pens and pretty note papers spread around, in the act of writing a note or with post-it notes stuck all over them. Do an act of service around the house; yours or someone else’s. You may know a new Mum, pregnant lady, an elderly person or someone who is sick. Tidy up an area, clean the bathroom and toilet, finish all the fixing in the fixing box, sew buttons or darn socks, tidy the bookshelves, or clean out the garage. Pose the Blessing Buddies wrapped up mummy style with thread in the sewing box, hiding in a bucket of cleaning equipment, hanging from the broom, making soap sculptures or laying inside a roll of toilet paper partway unrolled down the hallway as if they have been rolling along as it unravels. Do your sibling’s chores for the day. Pose the Blessing Buddies taking a boat ride in the sink with cleaning supplies, buried in a pile of mess or riding on the vacuum cleaner. Invite a friend or family member to a live nativity reenactment. Pose the Blessing Buddies holding tickets to the production and a carrot for the camels, or riding on a toy camel. Use the nativity set (or a Christmas book) to tell the Christmas story to your brothers or sisters. Pose the Blessing Buddies in a nativity sensory tub (A nativity set in a low flat container of dried beans or similar with rocks, artificial trees, block buildings, manger, stable, farm animals etc. ), feeding the animals in the nativity set or reading a Christmas book to the nativity set figures. Write to your sponsor child and/or send a Christmas gift. Pose the Blessing Buddies with a half written letter or with a sack full of miniature gifts. Make a meal for someone elderly or sick. Pose the Blessing Buddies on top of a tissue box, holding a tissue to their noses with lots of scrunched up tissues all about – sick Blessing Buddies. Decorate your own mailbox with pictures and a gift for the mailman. (Arrange to wait for the mailman that day to ensure he gets it.) Pose the Blessing Buddies in the mailbox with decorating and gift supplies or sealed inside a large envelope. Tape coins to a vending machine; the emergency room at a hospital would be good. Pose the Blessing Buddies inside a money box or inside an open chip or confectionary wrapper with just the toes sticking out and a few crumbs lying next to it. Leave money for the merry-go-round in the shopping centre. The children could do jobs around the house to earn the money to do this. Pose the Blessing Buddies holding a long list of jobs for the children to do titled “Will work for coins” with a pencil behind their ear. Include check boxes next to each job with money to be earned for each task, including a few treat “jobs” such as eat a cookie. Hide $2 coins in the kids’ toy section at the discount variety shop. Pose the Blessing Buddies sitting inside a toy car going for a drive with some other toys or on a toy train on a train track with other toys on carriages behind. Go for a walk around the local area leaving Christmas lollies, chocolates or candy canes with a note of explanation; people may not eat them otherwise. Good places are bus stop seats, on the top of log fences or wherever people will see them easily. Pose the Blessing Buddies in a ballpit of lollies or riding a candy cane sled down the banister or stairs. Invite a lonely person/neighbor round for morning tea and bake special treats for them. Pose the Blessing Buddies making “snow” angels in 100’s and 1000’s spread on the bench or sitting in a teacup with teabags spread about. Gift and cards for piano teacher (school/ballet/sports teacher etc.) Pose the Blessing Buddies playing piano with sheet music set up in front, dressed in sports team colours/uniform with game snacks or wearing miniature bathers/ballet slippers or some other relevant item. Work at a Christmas day soup kitchen serving meals for the homeless. Pose the Blessing Buddies surrounded by veggies on the cutting board with a miniature knife in hand or sleeping in a tissue box with a tissue for a pillow and one over the top as a sheet with a note; I have a bed but some people don’t. Buy a newlywed or elderly couple a Christmas tree and decorate it for them. Pose the Blessing Buddies in a toy car with a miniature Christmas tree strapped to the roof (Use one branch/leaf from a regular size tree), standing decorated with bows and bells or hanging from the roof on a strand of tinsel. Prepare Jesse tree symbols and readings for someone. Pose the Blessing Buddies hanging on the Christmas tree as if they were a decoration or as if constructing the symbols. Knock and run nativity (With poems of explanation for each one, secretly deliver 1 figure from the nativity each day to a neighbor, leading up to baby Jesus arriving on Christmas day. I have printables you can use for this – coming soon.) Pose the Blessing Buddies sitting in the manger cross-legged in front of Jesus or with baby Jesus in their lap. Go on an emu hunt (rubbish collection) in a public area and wherever you go for the day. Pose the Blessing Buddies hiding inside a miniature bin, inside the bag bag (plastic bag holder) finding bags for the rubbish, standing next to a pile of trash or facing a waste paper basket partly filled with crumpled newspaper balls with several balls on the floor as if they have been throwing them into the bin. Leave a sandpit toy at the local play area with a note of explanation. Pose the Blessing Buddies wrapped inside a box with the new sandpit toy or making sandcastles in the sandbox outside. Chalk messages of thanks or encouragement on people’s driveways. (We love the beautiful flowers in your garden, thank you for being great neighbours, have a wonderful Christmas etc. )Pose the Blessing Buddies holding a stick of chalk with a message drawn on a mini blackboard or sitting on your own driveway with a message in chalk. Donate toys or books to a waiting room. Pose the Blessing Buddies inside a slinky toy in the process of “walking” down the stairs, playing a board game or having a cotton-ball snowball fight with other toys from behind a Duplo or block fort. Leave plastic dinosaurs all around a playground. Pose the Blessing Buddies squeezed inside the plastic tube that the animals come in, riding on the back of a plastic animal or feeding the dinosaurs leaves. Leave bags of marbles in a playground. Pose the Blessing Buddies playing a game of marbles or inside the bag with their heads poking out at the neck. Make care packs for the homeless. (Our church will be coordinating this for us.) Pose the Blessing Buddies with Blessing buddy care packs for the children – snacks for the car, special drink etc. New mother bags/gifts at hospital. Pose the Blessing Buddies building a nappy tower (roll nappies tightly and tie with an elastic band), wearing a miniature nappy (pin a piece of white fabric) or swaddled and sleeping in the dolls house cot. Pick out a gift for the Kmart wishing tree (gifts for disadvantaged kids.) The children could work to earn the money to spend on this. Pose the Blessing Buddies sitting with a tiny gift as if ready to open it (the kind that hang as decorations on the Christmas tree), gift wrapped and surrounded by scissors, tape and off-cuts or have gift bows stuck all over the bathroom mirror with the blessing buddies attached to the mirror by one of the bows. Hide money in the supermarket shelves with a note for a shopper to discover. Pose the Blessing Buddies sandwiched between tins and boxes in the pantry or squeezed inside a pantry storage jar with their face and hands pressed against the glass peering out. Have a pre-Christmas clean-out and donate good quality toys or clothes to charity. Pose the Blessing Buddies spelling out a message in magnetic letters on the fridge or inside a building made from the kid’s construction set. Put together pyjama and care packages for the local women’s refuge. Pose the Blessing Buddies brushing their teeth on the bathroom sink with a message on the mirror in toothpaste or having a bath in the dolls house bath with mini face washer and soap, hair wrapped in towel. Write and send Christmas cards to friends and family. Include a family photo, tract, yearly wrap up letter and family update. Pose the Blessing Buddies sitting with a camera, surrounded by photos of themselves up to various antics, with the camera and other teddies all set up for a group photo, in an open box of cards with pens, envelopes and stamps or with a letter written and addressed to the kids (from the Blessing Buddies) for them to open. Donate food to the local food bank or church food parcel. (Include some special Christmas foods.) Pose the Blessing Buddies balanced on top of a tin can pyramid or rolling cans down the stairs. Leave candy canes or treats on cars in a car park. Pose the Blessing Buddies holding a note that says “I have hidden (however many) candy canes in this room. How quickly can you find them?” or hanging upside down from a candy-cane and ribbon swing or trapeze. Post or deliver a book about the true meaning of Christmas to someone. Pose the Blessing Buddies sitting at the computer with the screen open to Book Depository or another online book retailer or reading a mini bible to the other teddies. Take Grandparents or friends on a drive to see the Christmas lights (Kids make invitations several days ahead) Wear PJ’s, play carols on the stereo and if 2 cars are needed, change combinations after each stop and talk to each other through walkie-talkies. Stop for a treat on the way or take hot chocolate in a thermos for the road. Pose the Blessing Buddies holding golden tickets to “Mum’s Minivan Christmas Lights Express” with a single hole-puncher to punch tickets as people enter the vehicle, sitting inside disposable coffee mugs with lids (for the hot chocolate) and special snacks to have on the way or having a marshmallow snowball fight. Tape a gift card to a shopping trolley. Pose the Blessing Buddies holding a blessing buddies shopping list or a little bag with gift card inside. Take activity packs, crafts, balloons or colouring books to kids in hospital, a friend’s sick child or a disadvantaged family. Pose the Blessing Buddies surrounded by crayons with half-coloured picture in front of them, hanging under a large bunch of helium balloons or in a little basket under a single balloon made to look like a hot air balloon. Tape snack size popcorn, biscuits or chip packets to shopping trolleys. Pose the Blessing Buddies sitting on the stove holding a wooden spoon and cooking up a “dinner” of Skittles/popcorn etc. in a small frying pan. Leave treat bags in all the teacher’s pigeonholes. (Clear this with someone in authority first.) Pose the Blessing Buddies with paper bags/baskets/boxes and craft materials to decorate or eating a chocolate; unwrapped with a chocolate smudge on face and chocolate crumbs around them. Wait at the bus stop and give the driver a coffee or homemade muffin or ask permission to jump on the bus and give all the passengers a flower or treat. Or just give them to the line of people waiting at your bus stop. Pose the Blessing Buddies riding on or in a toy bus, making a cup of coffee with instant coffee granules spilt across the bench or holding a bouquet of flowers. Give bubble mixture sets to kids in a public area. (The kind that are given out at weddings are pretty cheap.) Pose the Blessing Buddies holding the bubble blower, mixture open, with dribbles about. Fruit for firies: Decorate boxes and fill them with fresh fruit to deliver to the local fire station. Pose the Blessing Buddies sitting in the fruit bowl with a peeled banana in their lap as if eating it. Nuts for nurses: take a bowl or box of small nut snack bags and leave them on the bench at the hospital nurses station. Pose the Blessing Buddies wearing a nurses uniform, one doctoring the other with a miniature doctors kit or cracking nuts with a nut cracker. Host a high tea for all the little old ladies at church or anyone you know who would appreciate it. Perhaps invite all the ladies in your street as a way to get to know your neighbours. Make a little craft, treat or decoration for each lady to take home. Pose the Blessing Buddies making the take-home gift such as beaded angels, miniature Christmas puddings or rocky road etc. Go through the McDonalds drive-through for icecream cones and pay for the order of the car behind you. Pose the Blessing Buddies holding an empty icecream cone and ice-cream scoop or riding in a line of toy cars with several other toys as if in a drive-through or stopped at a window of a take-away shop made from Lego. Blessing balls. Hang fillable baubles on Christmas trees in shop windows or at friend’s houses filled with edible treats or coins etc. Pose the Blessing Buddies squished inside a clear fillable bauble, hanging in the Christmas tree. Leave a very generous tip at a restaurant.Pose the Blessing Buddies sitting next the word “tip” spelled out with coins or drinking from a glass using a bendy straw. Give gingerbread biscuit nativity scenes to Sunday school teachers or neighbours. Pose the Blessing Buddies asleep on the packet of biscuits with head on a marshmallow pillow. Make a list of things you love about someone and send it to them. Pose the Blessing Buddies holding a long list of things the blessing buddies like about the kids. Send postcards or Christmas cards to friends who have moved away or people who used to go to your church. Pose the Blessing Buddies in the midst of writing a postcard or Christmas card to the kids themselves. Give popsicles to outdoor workers (in hot weather.) Pose the Blessing Buddies hiding inside one of the popsicle molds or eating their own miniature popsicle – made of felt? Conduct a Christmas chocolate survey at your local shopping centre. Write down the name of the shop and ask the cashiers to tell you their favourite chocolate. 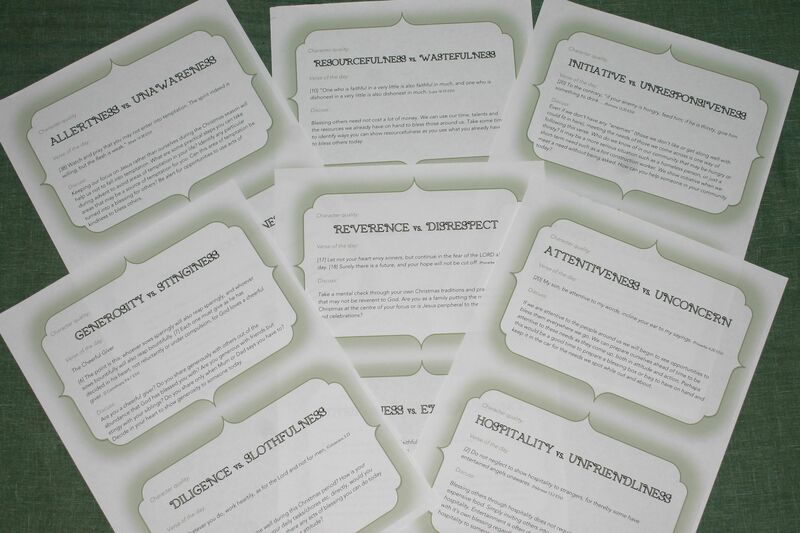 Purchase their choices and slide them into decorated bags with a tract and card and tag of explanation. Deliver them back to the cashiers anonymously if possible. Pose the Blessing Buddies holding a partially eaten chocolate bar with a smudge of chocolate on their face, looking through junk mail catalogues or holding a pre-printed survey page with a bunch of cut out bag tag poems of explanation (I have printables.) Have the Blessing Buddies favourites already written onto the survey page. Pass out stickers to children waiting in a doctor’s office. Pose the Blessing Buddies covered in stickers. Take board games to a nursing home and play games with the elderly. Pose the Blessing Buddies playing a game of Monopoly with some other toys. Decorate placemats for meals on wheels or your church’s food parcel ministry. Pose the Blessing Buddies sitting at the dolls house table and chairs with dinner set out on the table. Hold a spa day at a nearby nursing home for residents: paint their nails and do their hair and make-up. Pose the Blessing Buddies with their hair in crazy designs or sitting underneath a message on the bathroom mirror written in lipstick, with the lipstick open next to them. Donate your gently used stuffed animals to a local firehouse or police station to give to children in emergencies. (Do they do this in Australia??) Go to op shops and choose nice stuffed toys to take or donate your own. Pose the Blessing Buddies hidden in a large pile of stuffed animals with only their faces showing, camping out with other teddies in an A-frame tent (T/towel over string between chair legs?) or tucked up in bed with the other teddies. Leave notes/postcards/sticker pages in your favourite library book for the next child to find. Pose the Blessing Buddies sitting on a pile of books with one open that they are reading to a bunch of toys or peeking out from between the books in the bookshelf. Decorate the rubbish bin for the collector with posters and a gift. (We would need to stake out the truck and give ours in person as they usually wouldn’t get out of the truck.) Pose the Blessing Buddies tight-rope walking or riding a flying fox between the 2 rubbish bins. Pay for the meal/coffee of the person behind you in a take away line. Pose the Blessing Buddies inside a hamburger box or take-out coffee cup. Buy a gift voucher for the person behind you in the supermarket check-out lane. Pose the Blessing Buddies in a big box of packing peanuts gift wrapped, holding the voucher, building a coin stack or hiding in Mum’s shopping bag. Leave a food parcel for someone in need; knock and run style. Pose the Blessing Buddies in the oven with cooking equipment, recipe and ingredients or reading recipe books with a mixing spoon and measuring cups in their hands. Start a Christmas book per day tradition – wrap 24 books in paper to be opened each day in the lead up to Christmas. Choose 1 today to read to your little brother or sister. Pose the Blessing Buddies sitting on the books with a large ribbon tied over them and the stack, with scissors and wrapping paper and scraps as if just finishing wrapping up the books or bound head to toe in the ribbon used to wrap the book stack. Make a cake for Jesus and start Christmas morning by singing Happy Birthday to Him. Pose the Blessing Buddies with an electric tea-light decorated to look like miniature birthday cake with a lit candle on top or holding a party whistle and wearing a party hat. Sell stuff you no longer want or need and donate to your favourite charity or someone who needs it. Pose the Blessing Buddies sitting inside a large heart shape made of coins. Babysit for a single Mum or a friend so that they have the opportunity to go Christmas shopping or out for the evening. Have the kids plan games/craft/activities for the children you are watching. Pose the Blessing Buddies sitting on a couch cushion eating a bowl of popcorn with a TV remote control next to them or cutting out paper snowflakes with cuttings spread everywhere while sitting at a doll-house sized table and chairs. Weed a neighbor or elderly person’s garden. Pose the Blessing Buddies outdoors in the garden planting a row of lollipops. Organise a garden makeover for someone in need. Pose the Blessing Buddies next to a little pot of soil with candycanes growing out of it or holding a seed packet with “candy cane seeds” written on the side. Brave the cold (for those experiencing a white Christmas) to deliver hot chocolate to an outdoor worker or bell ringer. Pose the Blessing Buddies sitting on the top of a large mug filled with mini marshmallows holding a teaspoon. Place a tin of cocoa next to the mug. Brave the heat (for those of us in the middle of summer!) to deliver cold drinks to construction workers or anyone who needs to be outdoors for any length of time. Pose the Blessing Buddies having a picnic with some other dolls and teddies using a child’s tea set. Fill parking meters that have nearly run out. Pose the Blessing Buddies as if they are having a car race with some other toys (all driving their own vehicles) and a finish line sign set up. Bring in all the neighbour’s bins after the rubbish truck has been. Pose the Blessing Buddies climbing a rope up the side of the bin or abseiling down the side. Good question, will edit the post and add that. They are the kids from a wooden doll house family from Kmart. They came with a Mum, Dad and baby for $15. The suitcase came off someone’s verge during the local verge collection! I just fixed it and covered it with Christmas paper. Sorry, don’t know where to find those in a shop; maybe somewhere like the craft section in Spotlight or Bunnings where you buy the blank cardboard/MDF wood boxes and shapes for craft projects? That is amazing and so generous of you to give us all your files etc too. You’re welcome Debra. It would be cool to see a whole heap of families blessing others over Christmas. I love this idea, I have tried everything to download the poem and cards but nothing b works. Anyway you could email them please?